Soft and natural feeling, dermal fillers can help smooth wrinkles, restore volume to aging features, or enhance facial contours. In young to middle-aged patients with minimal to moderate signs of aging, injectable fillers are often the first step in seeking facial rejuvenation. Wrinkle fillers allow younger patients to combat the first signs of visible aging without invasive surgeries. As these patients age, surgery combined with fillers and resurfacing treatments becomes the next step to maintain a youthful look. Injectable wrinkle fillers also allow older patients to look refreshed and not be burdened with the recovery time of more major procedures. Older patients who desire the more significant improvements provided by a facelift or other surgery often choose to complement their surgical results with wrinkle fillers. During a comprehensive skin evaluation, Dr. Parker will listen to your goals and concerns and determine the best facial rejuvenation treatment plan for you, including what filler product will offer you the best results. Most injectables fall into the category of temporary “fillers” and are designed to fill in or soften skin folds, some dynamic wrinkles, and depressions in the face. These injectables are either biologically derived from organic sources or consist of synthetic materials which disappear after a period of time. This is a newer FDA approved filler option, made from hyaluronic acid, a naturally occurring substance already in your skin. It is formulated to integrate into your tissues quickly and evenly, making it a good option for fine lines around the nose and mouth. Treatment takes about 15 minutes and there is no downtime. Results typically last about 6 months before your body naturally absorbs the hyaluronic acid. These products are dermal fillers that are based on hyaluronic acid and work together with the body’s own hyaluronic acid to plump up tissues under the skin. These fill wrinkles and depressions in the face to make you look younger instantly. 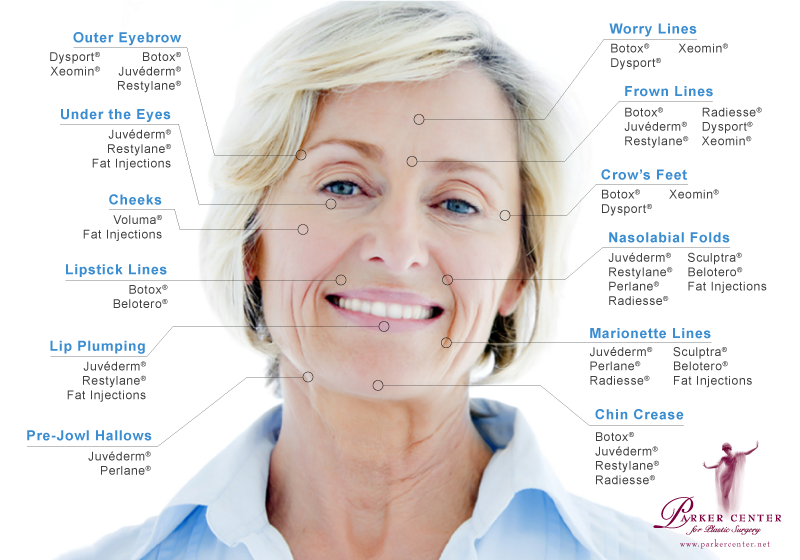 Juvéderm® and Restylane are effective for the nasolabial folds, under the eyes, between the eyebrows, and to raise the eyebrows, soften the chin fold, soften acne scars and for lip plumping. Studies show that results last up to 6–12 months. Restylane is also FDA approved for lip enhancement in patients over 21. It offers a cost-effective, minimally invasive alternative to lip implants, and results can last up to 6 months. What if you could earn exclusive rewards, bonuses, and discounts when you visit your plastic surgeon or aesthetician? Now you can, with ASPIRE Galderma Rewards! ASPIRE Rewards is a great new loyalty program from Galderma that offers specials savings and rewards when you receive treatment with their products, including Dysport® and Restylane®. When you join ASPIRE, you’ll earn points by using Galderma’s products—and throughout the year, you’ll also be rewarded for being a loyal customer. Points can be redeemed for a number of rewards, including check cards, savings on future treatments, and certificates for Galderma’s retail boutique featuring your favorite brands. Sign up now, and you’ll instantly earn a $20 treatment certificate! It’s free to join and your rewards start right away, so what are you waiting for? These fillers are designed for deeper injection to treat more severe nasolabial folds, deep marionette lines and the pre-jowl hollows. The difference in is the gel particle size; the particles of hyaluronic are larger and better suited for deep injection. Perlane® is part of the Restylane® family, and Juvéderm Ultra Plus® is a version of Juvéderm that serves the same purpose. VOLUMA™ is a hyaluronic filler designed specifically to lift and restore volume to all three areas of the cheeks: the apple, apex, and hollow. The only filler currently FDA approved to volumize the cheeks, it can also be used to add definition and contour if your cheeks are naturally flat. Treatment takes less than 30 minutes and the results are immediate. The results of VOLUMA™ can last up to 2 years, making it a cost-effective option to enhance the cheeks and rejuvenate your appearance. This filler is made of calcium hydroxiapatite (CaHA), a primary component of teeth and bones. This product has a thicker consistency and is best for deeper nasolabial folds, marionette lines, between the eyebrows, nasal depressions, and the mental fold. The consistency of this product allows it to last longer than most fillers, up to a year or longer. Re-injection of your own fat, called autologous fat transfer, is also considered a filler procedure that is longer lasting. Dr. Parker performs all fat transfer procedures at the Parker Center. Our nurse injector, Angela Parisi, RN, works closely with Dr. Parker to administer filler injections using the above FDA-approved dermal filler products. With over 21 years of experience working directly with our patients at the Parker Center, Angela has developed a keen eye for aesthetic detail while undergoing specific training to performing cosmetic injections. Angela’s patients are consistently delighted with their results, noting how natural they look after their treatments.